New Orleans How about some good news for a change? Yes, I’m with you. I found some in a surprising place on the other side of the proposed wall between Mexico and the Untied States and in all places in Matamoros, right across the river from Brownsville, Texas. If you’ve ever been to Matamoros, you already know that they are desperate for some good news down there on the other side of the Rio Grande Valley. The city has a special place for me because a million years ago it offered my first experiences in that great country. I was driving down there in one of my old junkers with a dog and a tent curious about the valley and came across the bridge from Brownsville for several hours into another world. More recently in another century, we drove through the city after Katrina headed toward the central high plains of Mexico, but I’m still shocked to read that Brownsville reportedly has 500,000 residents now. What doesn’t shock me is the fact that a key driver of the city’s economy is its proximity to the United States and the maquila plants that fabricate all manner of things for export back to the US. It almost goes without saying, but I’ll be Mr. Obvious, that the attraction for foreign manufactures is cheap labor. The good news though is that something is being done about all of this partly due to the election of the left leaning new president, universally called AMLO, Andrés Manuel López Obrador, who has created the climate for more worker justice and fair labor laws. He has proposed raising the minimum wage national by 16% to around $5,30 a day and on the border to $9.20 a day. Maquiladoras earn about $2.40 per hour compared to US manufacturing workers make more than $20 per hour by comparison. 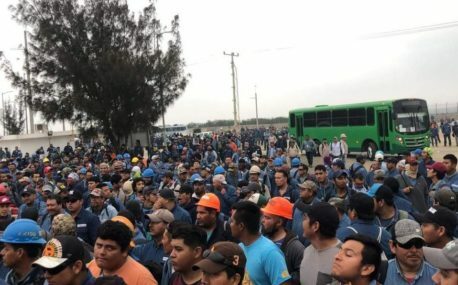 Mostly though it has to do with a wave of strikes by over 55,000 maquiladoras in the 115 plants around Matamoras demanding 20/32: a 20% wage increase and a one-time bonus of 32,000 pesos or $1655. This has become a movement and according to many including Susana Prieto, a lawyer and one of the strike’s primary backers and organizers, 85 companies have settled while five are still on strike, including Coca-Cola. Prieto, an advocate of an independent labor movement given the past record of the traditional, party-connected union federation, is hoping to push the movement to expand to other border cities, including Juarez where she has practiced labor law and led successful strikes in recent years. Let’s hope this movement comes north! New Orleans In the breathless and world shaking tone common to television and radio broadcasts, economists were trying to parse the numbers in the federal report on jobs and wages for February. Growth was almost nonexistent at 20,000 new hires, and there was a lot of “he-say, she saying” back and forth on that. On the other hand, wages were up over 3% compared to February 2018, leading some to hope against hope that workers might finally be getting a share of the robust economy, although that is doubtful. Others chortled that with statistical unemployment dropping to 3.8%, the US was actually approaching “full employment.” Interesting, but is that really true? Not to be negative, but it is worth recalling that statistical unemployment masks a huge number of the unemployed as the formulas are jiggled from administration to administration in the Bureau of Labor Statistics. So-called “discouraged job-seekers” are a good example since that category is likely a disguise for applicants continuing to roll in for nonexistent jobs in rural areas and some job markets. Gig workers were also over-counted by many miles for a long time, so it is unclear to me how they fit in this number. Young, minority, and other workers are also rarely employed fully. Searching back in distant memory there was a huge fight over full employment and job creation called the Humphrey-Hawkins bill, popularly named after Minnesota Senator Hubert Humphrey and California Congressional Representative, Gus Hawkins. It is often called the Full Employment act. The technical name is Full Employment and Balanced Growth Act. 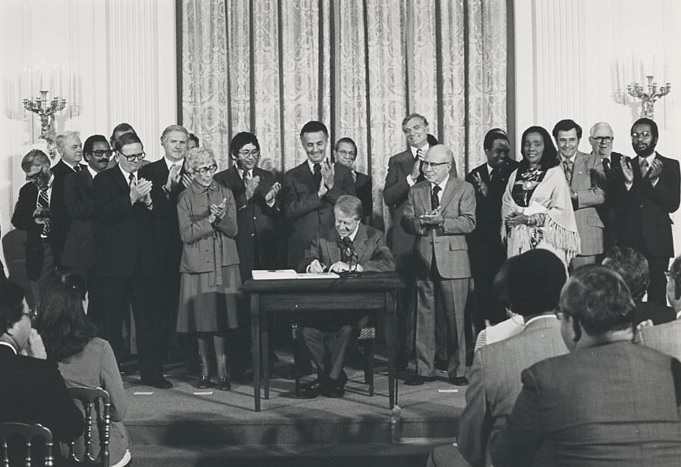 It was more than a fight, it was also a victory, winning passage in 1978, during the recession at that time, and signed into law by President Jimmy Carter. The most interesting and important part of the mandate is that the Act instructs the Federal Reserve to manage monetary policy with a central objective of creating full employment. Not surprisingly, conservative Republican forces on a regular basis try to repeal any notion of full employment in order to push the priorities as nothing more than inflation or maybe improved trade balances. If you think we’ve hit full employment though, think again. By the definitions of the Act within five years or 1983 “unemployment rates should be not more than 3% for persons aged 20 or over and not more than 4% for persons aged 16 or over, and inflation rates should not be over 4%.” We’re nowhere close to that figure and have never been whether in 1983 or 2017 after forty year under a full employment policy. Importantly, the Act mandates that if the private sector cannot achieve these goals, then it is the federal government’s responsibility to create “a reservoir of public employment” to make them real. Now, that’s more than a great idea. That’s the law. It’s time to enforce the full employment law fully, not pretend we’re already experiencing it when we all know people who are more fully unemployed, than employed.